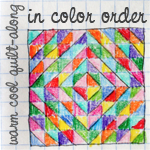 I love the idea of a warm/cool value quilt rather than the more common light/dark value quilt, so I joined the warm/cool value quilt-along (link on the sidebar). I've also joined the 60 Blocks in Summer group on Flickr, so this is my first entry! 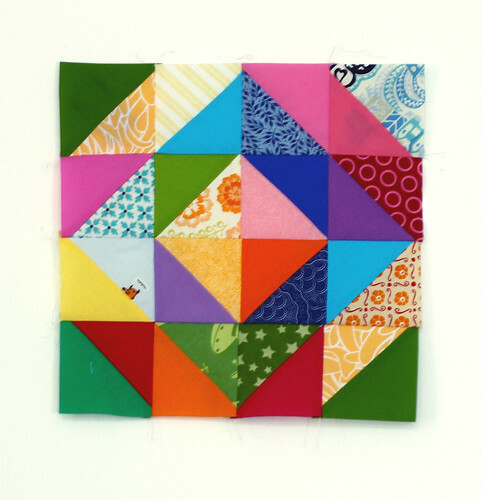 This is the first block for the value quilt, and I quite love it. I'm not really following the layout Jeni is doing in the quilt-along...I hope thats ok... I started with a Kona Cotton Brights charm pack, and paired each with an opposing value scrap fabric. I'm not sure how big it will become, each HST unit is only 2.5 inches finished.